Nightmare? Passionate dream? Real? How could it be real? It can’t possibly be real. Rosemary Woodhouse wants a baby. She is married to an actor named Guy. They have recently broken another lease to take an apartment in the exclusive Bramford Building. Guy, who glibly uses his acting skills to spin stories, has no difficulty extracting them from the first lease to take the open apartment in the Bramford. After all, that is what Rosemary wants. Whenever any of us look back on our lives, we can usually point to a specific moment in time when we made one decision that sent us down a pathway that led us, hopefully, only briefly, astray from the pursuit of happiness. None of us, or maybe I should say few of us, can see the future. We have to make our best guess, hopefully based on more logic than a hope of luck. The apartment at the Bramford had more Gothic overtones, detailed woodwork, and certainly a more interesting location than the other apartments the Woodhouses had looked at. Although smaller than some of the other places, having a hip apartment, especially to young pseudo-intellectuals, is much more important than a few extra square feet of space. They should have kept the first lease on the other apartment. I can’t help but think of Bram Stoker every time the Bramford name dances before my eyes on the pages of this book. Strange things have routinely happened in this apartment building. Unexplained, sometimes brutal, deaths have occurred too frequently to be ignored, especially if you are an inquisitive man, such as Rosemary’s dear friend Edward Hutchins. He, on further investigation, finds that there are far more sinister stories surrounding the history of that building than are known by the general public. He discourages Rosemary from continuing to live there, but she is a rational, modern woman who doesn’t believe that a building can have sinister connotations. 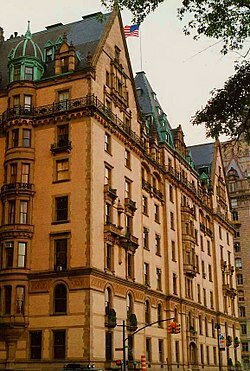 Polanski used the Dakota for the outside shots of the Bramwell building. She might ignore the past and the warnings that come with it, but she does feel flutters of unease that are based more on what can easily be quantified as primordial superstition than on any real basis of fact. Coincidences do happen and can seem ominous or alarming to someone who is already hearing the tap tap tap of paranoia on the door of reason. Their next door neighbors are Roman and Minnie Castevet, who seem to be a well meaning, overly friendly, almost smothering, older couple. They are delighted to hear the news when Rosemary is pregnant. They suggest a more fashionable obstetrician and even a different regimen of vitamin enriched drinks than what her previous doctor had recommended. Rosemary goes along because Guy is so insistent, but the longer it goes on, the more suspicious she becomes of everyone’s motives. I’ve been wanting to read this book for years. I’ve put off watching the famous movie by Roman Polanski because I wanted to read the book first. The story has become such a classic icon that people know the bare bones of the story without ever having read the book or seen the movie. The pacing of the book is simply a superb example of a writer who knows how to build tension and unease. 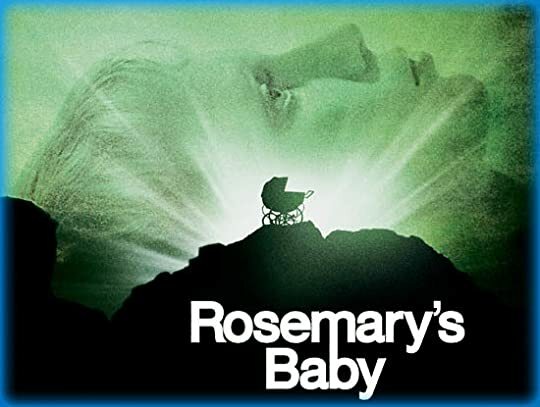 By the time Rosemary is approaching the bassinet to see her baby for the first time, I was biting my knuckles, and the hackles on the back of my neck were not only raised but vibrating. I know what she is going to see, but until I read the words, I can hold off fully realizing the implications. I loved the fact that Rosemary is a reader. Two books that were mentioned that stand out were Flight of the Falcon by Daphne Du Maurier and The Rise and Fall of the Roman Empire by Edward Gibbon. I love it when books are part of the lives of the characters I read about. I’m a huge fan of Du Maurier and plan to read Rosemary’s choice soon. I was even more impressed by her taking on Gibbon. I have six volumes of Gibbon staring me in the face every time I pick my next book to read. Yes, yes, I will read Gibbon. I must read Gibbon to call myself a reasonably educated man. Rosemary’s Baby was published in 1967, the year of my birth, and has held up superbly, certainly much better than I have. It is a quick, flashy read that will give chills and thrills to all but the most jaded modern reader.